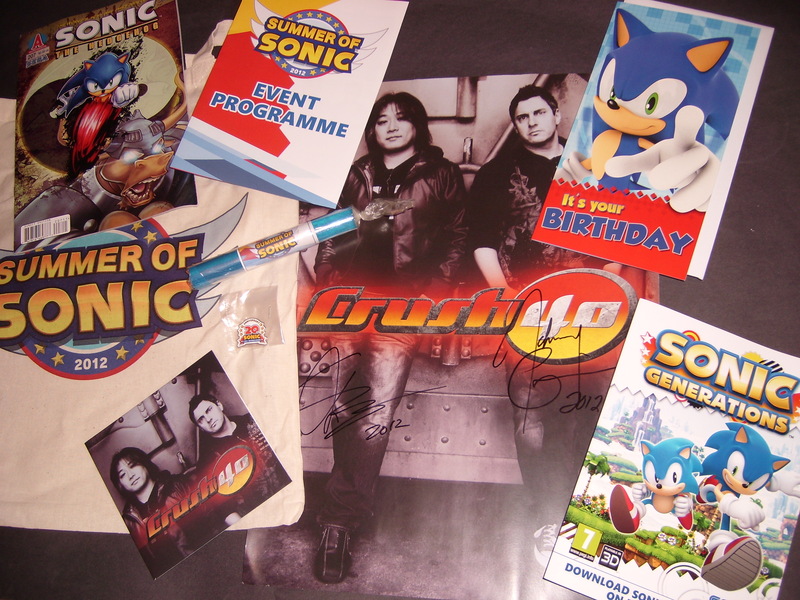 Competition: Win a Summer of Sonic Goodie Bag + Crush 40 Signed Merchandise! Sore you couldn’t go to Summer of Sonic? Bummed out that you can’t go to Sonic Boom? Nothing can compare to being there on the day, but we hope to give two very lucky readers out there a little piece of the UK experience with our Summer of Sonic goodie bag! We have a pair of these to give away, which include the Summer of Sonic tote bag, an Archie comic, a Summer of Sonic programme, a stick of Summer of Sonic rock, a Sonic birthday card and a code for Sonic Generations on the PC. As if that wasn’t enough, we’re throwing in one of the awesome 20th anniversary pin badges that have only been available at a few events, along with the brand new Crush 40 EP containing their three new tracks and a Crush 40 poster. What’s more; you will also receive the autographs of both Jun Senoue and Johnny Gioeli! So what do you have to do to nab these awesome prizes? Well, all you need to do is answer these three easy-peasy questions about this year’s Summer of Sonic Event! 1) Which two SEGA characters were announced for Sonic and SEGA All Stars Racing: Transformed by Steve Lycett? 2) What are the names of the two character theme songs that were performed by Jun Senoue and guest singers during the Jam with Jun? 3) Which two of our invited guests in attendance were involved with the UK Sonic the Comic? Send your answers to all three questions to the usual competition address at competition@sonicstadium.org along with your name. The competition will close at 5:00pm BST on Friday 20th of July, and two winners will be chosen at random out of correct entries; winners will be notified by email soon after. This competition is open worldwide, so wherever you are on the planet, feel free to enter! Next Post > Next post: [UPDATE: Roger Craig Smith Confirmed] Sonic Cameo Set For Wreck-It Ralph! I just sent in the E-Mail! has anybody found out if they have won yet?